Simply click and receive your weekly ad for sales in store. You may find coupons from time to time. In Store: Shop all day at Big Lots store on Sunday with extended hours to 10pm and get 20% off your entire purchase. Print coupon, or present barcode to cashier on your mobile device. Here's a direct link to the printable coupon. No coupon required online, discount will show at checkout. Shop at Big Lots this week and get up to $40 off purchases over $200, no coupons are required, discounts taken at register. Straight from Big Lots, print and save up to $40. Print coupon for a 20% discount on all kitchen appliances, coffee makers, irons, Keurigs, single serve coffee cups, fragrances and fragrance sets, Christmas trees, lights, and more. Save 10% on all fireplaces, and all toys. Valid in-store only. Enjoy a 20% discount on Fisher Price toys, tablets, Christmas trees, lights, ornaments & outdoor decor, cookware and dinnerware. 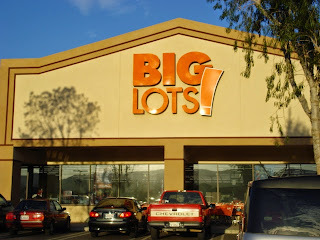 Big Lots is a store that offers discount values that other retail stores just can't match. Its one of the nation's largest broad line closeout retailers.